Remember the TV show Apple’s Way? I do, just barely. 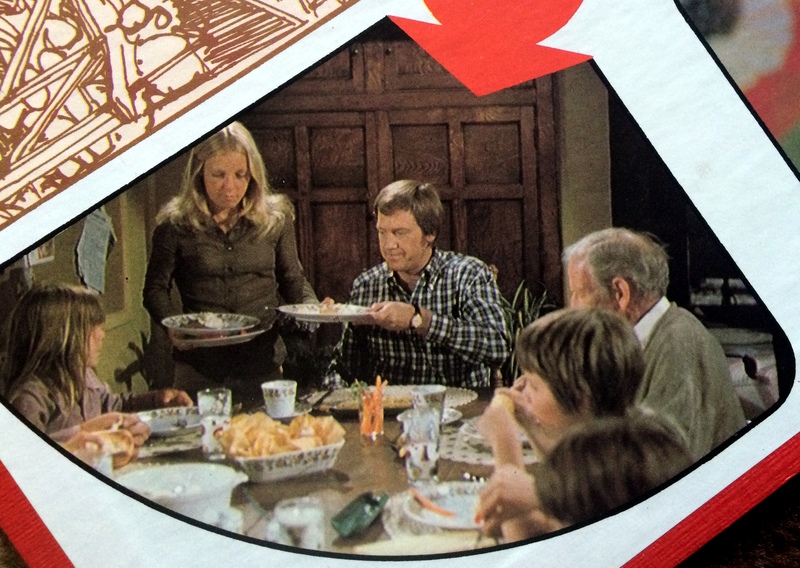 Earl Hamner created it as a modern take on the family themes that The Waltons explored so successfully.Wikipedia tells me that the Apple family followed that 1970s dream of ditching the urban rat race and retreating to the country. 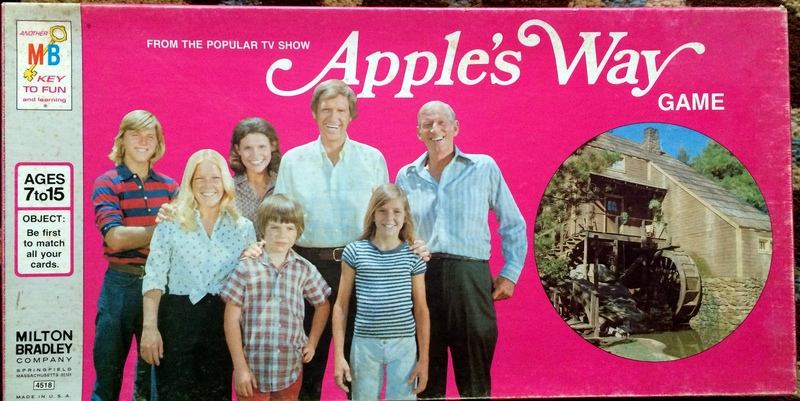 The set is the main thing that impressed me as a child: The Apples’ house had a cool interior and a working mill outside. 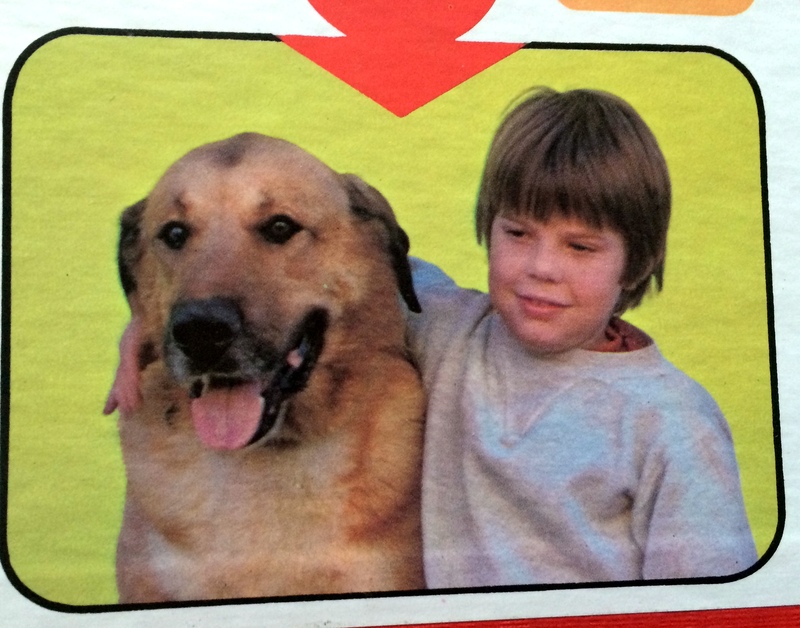 Also, I remember one episode in which the little boy got hit by a car. At least, I think I remember that–my memory for TV details is notoriously unreliable. Recommended Ages: 7 to 15. Object: Be the first to match all your cards. Game Board: Old-timey drawings of the mill alternate with color photos from the series. This close-up from the board shows that the Apples had a lamb. They also had a dog, apparently. And dinnerware that resembles Corelle. Game Pieces: Players move standard plastic pawns. 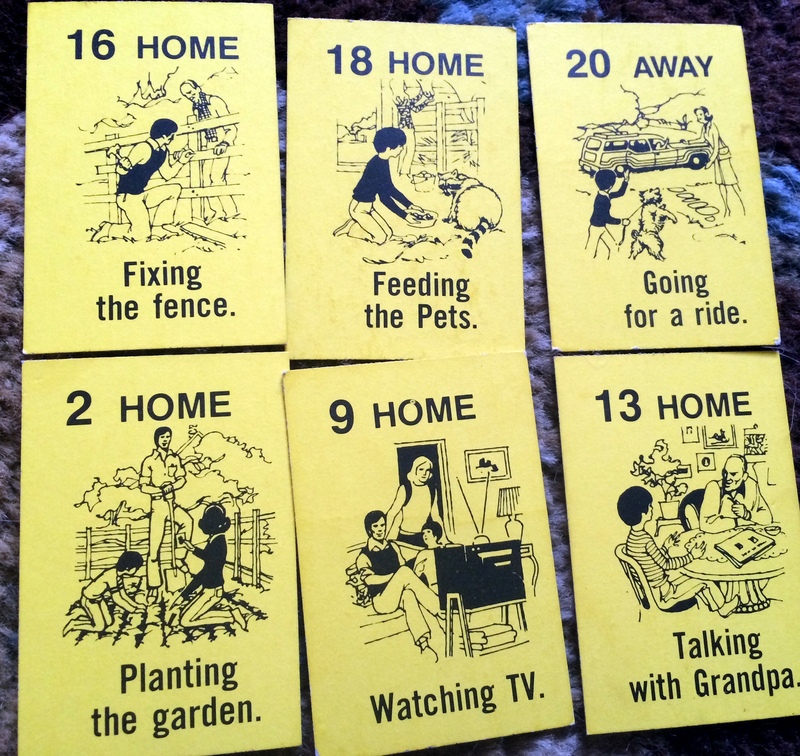 Green and yellow cards show the Apple family engaging in typical activities at home and in the community. Life for the Apples was a never-ending whirlwind of excitement. Game Play: Players get four yellow cards at the start. They move around the board and try to land on the picture spaces, where they can pick up green cards. The goal is to get green cards that match the numbers and activities on the yellow cards. Manufacturers add a few wrinkles to make things more interesting. For example, a player must announce whether he’s looking for a “Home” or “Away” card before he chooses a green card. If he gets the type of card wrong, he has to show the card to all the other players before putting it back in its pile. My Thoughts: On the plus side, I always like a TV game that includes color photos from the show. 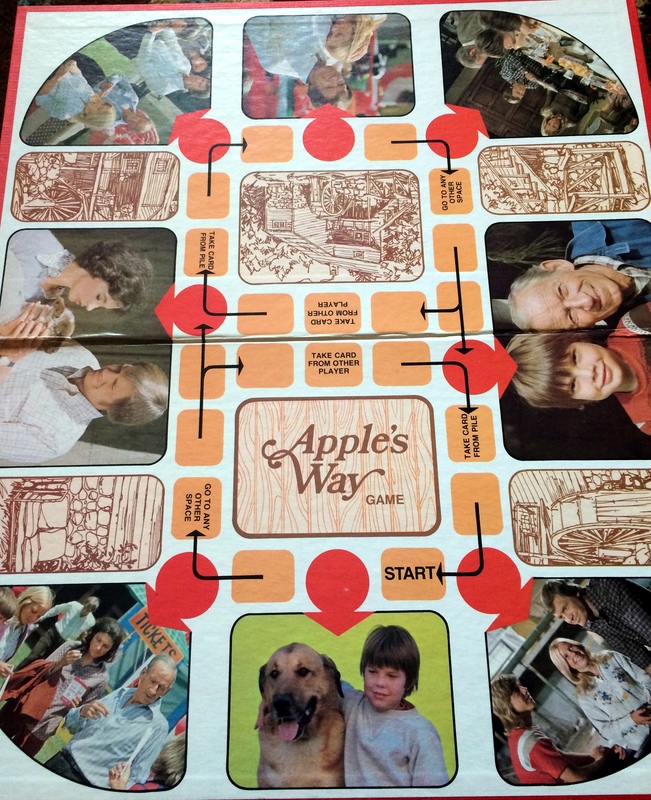 This entry was posted in Spin Again Sunday, Toys and tagged 1970s, Apple's Way, Board Games, Games, Nostalgia, Television, Toys, Vintage, Vintage Board Games, Vintage Toys. No way was this show popular enough to warrant a board game! LOL. Fun to read this, but your note about the Box doesn’t seem accurate. 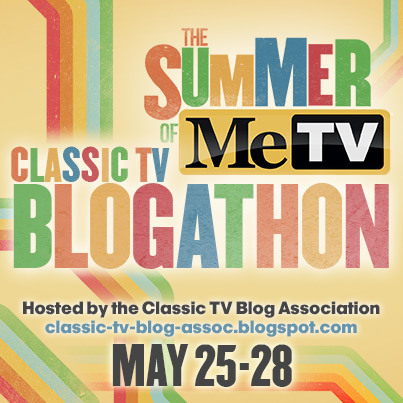 Patti Cohoon and Kristy McNichol BOTH appear on the box. Kristy replaced a different actress named Frannie Michel, right? 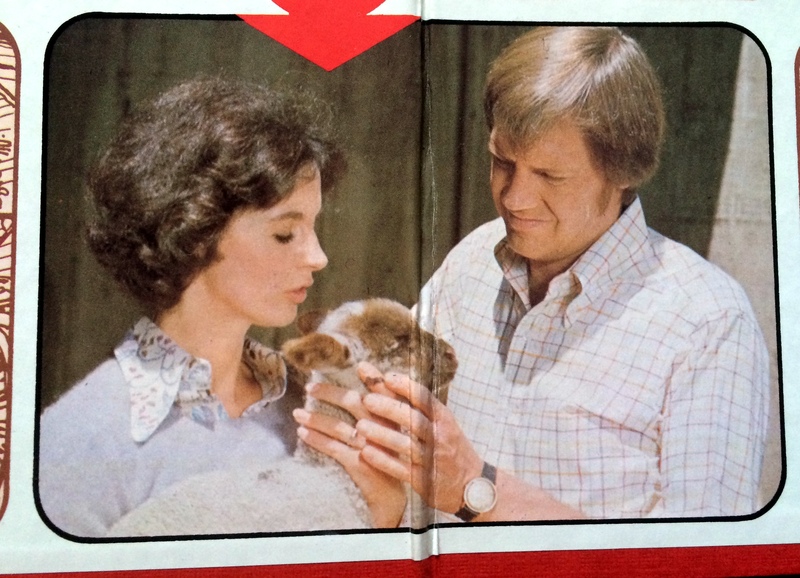 Whoops, you are right…McNichol replaced Frannie Michel. Is that really McNichol on the box? It doesn’t quite look like her to me, but I don’t know what Michel looked like. Thanks for commenting! I’ve never even HEARD of this show. Off to Google I go.